So this is the companion novel to Two Way Street, which I have not read, but let me reassure you: you don't really have to in order to read this book, it works perfectly as a standalone. I really like Lauren Barnholdt's books and when a new one comes out, it's automatically added to my TBR list, so I was pretty excited to start Right of Way. Also because I was really in the mood for a cute contemporary. And while I think I like some of her other books better, I really enjoyed Right of Way! The constant switching between the present and past and in the POV from Jace to Peyton and back again, Lauren Barnholdt really kept me on my toes, reading this required my full attention. But it never felt like a chore, because somehow she made it work. Jace and Peyton both have a distinct voice, though they are somewhat similar in their trains of thought. I didn't fully connect to either of them though, maybe because of the constant switching between their POV. One thing that didn't work so well for me was their backstory. I mean, they had the whole sweet romance going on when they first met and they're SO in love and then all of a sudden they stop speaking to each other? Over that?? I mean, seriously?? UGH! I didn't completely believe it, though I know sometimes there are really stupid reasons for relationships not working out. If they didn't have so strong a connection, I would have more readily believed this explanation I think. I did like the story Lauren Barnholdt weaves with the road trip that isn't much of a road trip actually but still fun to read about. Jace and Peyton and Jace's dog (who is AWESOME) have a little adventure and because road trips force you to be in each other's vicitiny for long hours, they couldn't get out of communicating and really, guys, communication is important. I also kinda loved Jace's mom! She's a fierce mama bear and I like that. There are some serious issues in the background of this lovestory and I kinda hoped we'd see them resolved within the novel, but we didn't really. 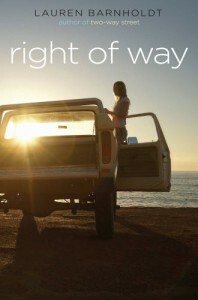 But Right of Way is a very entertaining read, perfect for the summer day it was while I was reading it!